There is nothing more special than that new addition to your family. The Sundae Palace will delight your guests with adorable baby shower edible party favors. 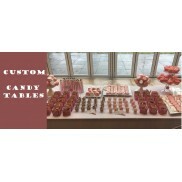 We are so happy to make your special event unique, sweet and memorable. The Sundae Palace will spend time with you to make your event “one-of-kind.” Have fun creating your special baby shower favors! If you need help or want to customize even more please call The Sundae Palace. 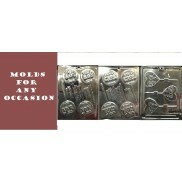 We so enjoy helping you make your baby shower a “Wow” event. Use Accent #1 to choose the chocolate color for "Baby". Use Accent #2 to choose the chocol..
A pair of baby booties in a clear box. The two different colors in the picture are only shown for d..
Use Accent #1 to choose the chocolate color for the blanket. Use Accent #2 to choose the chocolate c..
Use Accent #1 to choose the chocolate color for the baby outfit. 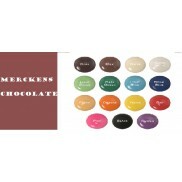 Use Accent #2 to choose the chocola..
Use Accent #1 to choose the chocolate color for "It's a Boy". Use Accent #2 to choose ..
Use Accent #1 to choose the chocolate color for "It's a Girl". Use Accent #2 to choose..
Use Accent #1 to choose the chocolate color for "It's Twins". Use Accent #2 to choose the chocolate..
Use Accent #1 to choose the chocolate color for Bow, Flower and Stripe on Rattle. Shown in picture i..
Use Accent #1 to choose the chocolate color for the Bear's Tie. Shown in picture is Pop fill col..
Use Accent #1 to choose the color of the Sugar Flower for the wheels. Shown in picture is Pop fill c..
Use Accent #1 to choose the chocolate color for the Bear. Shown in picture is Pop fill color is Milk..